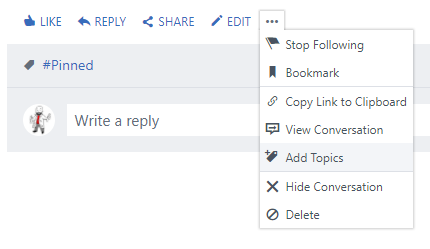 I have heard many arguments from people against using Yammer and the one that really sticks is when someone points something out and the fact that this simply drops in the feed and is ignored. The Yammer algorithm will push the conversation to the top if someone comments on it and “likes” from colleagues also help to show it to other people, but you can’t always count on that. The feedback you’re giving could be something that a lot of people agree with, but most people won’t attach their name to it by sharing your post, commenting on it or simply clicking on the like button. This is why an app such as Blind has gained so much popularity. The thing is that Yammer already has a feature that can help you deal with this, but it relies on a community of people making use of it for this purpose. The feature is called “topics”. It’s like a #hashtag on Twitter and allows you to label conversations or files and get updates about them by following the topic. You can follow a topic by clicking on it, visiting the topic page and clicking on the follow button. You have to manually visit this page to see the feed, but it will also be part of your following feed on the homepage. The cool thing about this feature is that it’s anonymous. 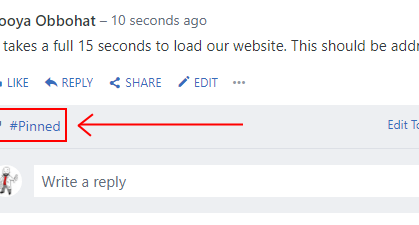 You can delete topics or add them without mentioning them in the actual post or a comment. All you need to do is use a specific topic (e.g. “pinned” as shown in examples above or any other word) and have an understanding with a group of your colleagues on what it means. You don’t have to hit the “like” button, share the conversation or comment on it, you simply attach the topic and thereby make it visible to the group of people using it. Sure, someone can also remove the topic, but you can go right ahead and add the label again. Someone removing the topic only means that it’s even more important to have that discussion. This concept only works if others join and have the same understanding about the use of the label and you could already get that by simply posting the idea on your Yammer network. It’s time for the elephants in the room to become more visible as it’s in your company’s best interest to follow up on critical feedback. The people or teams responsible should also make an effort to explain why they don’t agree with something and they should try to fix things if they do agree with the feedback. You can always add the topic to an old conversation if you notice that the situation hasn’t change week, months or even years later. How to start? You could share this article on your Yammer network or you can create a post and explain how it works. My advice would be to create a PowerPoint presentation and I’m happy to create it if there is enough interest. Having a group of people stare at a feed of critical, but ignored feedback won’t necessarily change anything. You’ll get far better results if you can get someone from management to join this movement and intervene when needed. My advice for management would be to create a dedicated private group for this and share pinned conversations to that group and have a discussion there. They can tag the person responsible for it there and that prevents others from joining that conversation. feel free to use my old email signature if you have also chosen the dark side and prefer Yammer or Lync/Teams for communication with your colleagues.